Kristy A. Schloss, Schloss Engineered Equipment, Inc.
For any freshman-level introduction to engineering course. Lively in format and filled with real-world vignettes, applications, and examples, this introduction to engineering is designed to keep students encouraged and motivated during their freshmen year when they can't yet see how all of the calculus, physics, and chemistry relates to their engineering education. The real-world vignettes and pictures capture not only the diversity of the profession, but of the engineers themselves, providing an overview of the various types of engineering as well as what working professionals do. 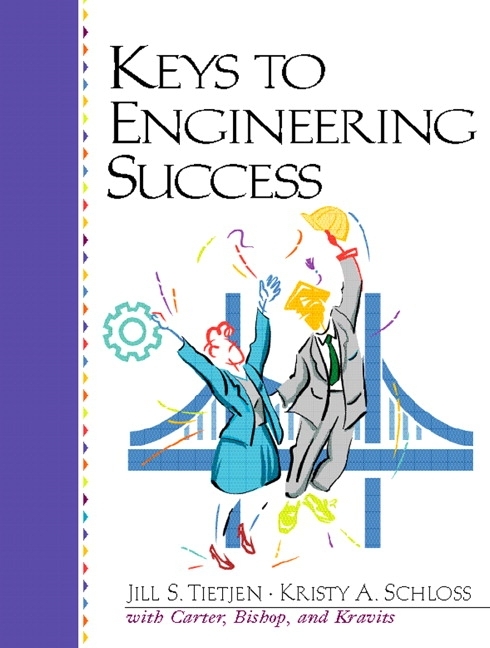 The text also features extensive information on engineering-specific study skills, gives hints and suggestions on how to enhance one's college experience, and provides information on what resources to look for and where to find them. An upfront description of engineering as a career—Discusses what engineering is, the many ways in which engineers contribute to the world, the significant variety of engineering professions, the ways in which an engineering education prepares students for a wide range of careers, demand and opportunities for engineers in the future. Profiles with a diversity of voice—Features vignettes in which successful professionals with engineering backgrounds describe their professional/educational experiences. The individuals represent various regions of the country and multidisciplinary and multicultural perspectives and experiences. Thinking skills—Contains a chapter on creative and critical thinking. Perforated exercise pages—Exercises are gathered together on perforated pages at the ends of the chapters. Definitions—Defines selected words in the margins of the text. · Video interviews on key issues ‘by students, for students’. · The Learning Path Diagnostic offers 65 Full Course Pre-Diagnostic (Bloom’s Taxonomy level 1-2) and 65 Full Course Post-Diagnostic Bloom’s Taxonomy level 3-4)questions, and 20 pre-test (Bloom’s Taxonomy level 1-2) and 20 post-test (Bloom’s Taxonomy level 3-4) questions. · The Practice exercises improve class preparation and learning. · Graded Activities build critical thinking skills and develop problem-solving abilities (includes Essays and Journaling). · Instructors benefit from an Implementation Guide to easily assign and assess progress. · Students have access to relevant FinishStronger247 YouTube videos, the Pearson student Facebook page chock full of tips, MySearchLab use for doing effective research, and more. PearsonChoices - CourseSmart and Custom Publishing. Having choices for how to deliver course content is important. · CourseSmart Textbooks Online is an exciting new choice for students looking to save money. As an alternative to purchasing the print textbook, students can subscribe to the same content online and save up to 50% off the suggested list price of the print text. With a CourseSmart e-textbook, students can search the text, make notes online, print out reading assignments that incorporate lecture notes, and bookmark important passages for later review. For more information, or to subscribe, visit www.coursesmart.com. · Pearson Custom Publishing allows professors to create their own professionally produced customized textbooks and media products to best complement their course. We offer high-quality content, professional design, quick production, and reliable on-time delivery. The result is a valuable textbook that students will use, cover to cover, tailored to meet exactly the needs of the professor, students, and course. Visit www.pearsoncustom.com. 2. Where to Get Help When You Need It. 4. Goal Setting and Time Management. 5. Critical and Creative Thinking. 6. Reading and Study Skills. 8. Listening, Memory, and Test Taking. 10. Managing Career and Money. 11. Changing With the Future. Appendix A. Types of Engineers. JILL S. TIETJEN, P.E., is a registered professional engineer whose area of expertise is electric utility power generation and transmission planning. Ms. Tietjen is the principal of Technically Speaking and previously served as the Director of the Women in Engineering Program at the University of Colorado at Boulder. She provides engineering consulting services building on her work experience with Duke Power Company and Stone & Webster Management Consultants, among others. Ms Tietjen served as the 1991-1992 National President of the Society of Women Engineers, of which she is a Fellow. She is an electrical engineering accreditor for the Accreditation Board for Engineering and Technology. Ms. Tietjen is a contributing author to the 1995 book She Does Math! She has a B.S. in applied mathematics, minor in electrical engineering, and an M.B.A.
KRISTY A. SCHLOSS is the president of Schloss Engineered Equipment, an environmental equipment design and manufacturing firm. She was the 1999 National, Regional, and Colorado winner of the Exporter of the Year award from the U.S. Small Business Administration. Named a Distinguished Engineering Alumna from the University of Colorado at Boulder, Ms. Schloss has also received the Honor Award from the Colorado Engineering Council. A life member of the Society of Women Engineers, Ms Schloss was appointed by the Secretary of Commerce to the Environmental Technologies Trade Advisory Committee and the District Export Council. Ms. Schloss writes and speaks regularly on the opportunities for and rewards of being an engineer. She has a B.S. in civil engineering. CAROL CARTER is Vice President and Director of Student Programs and Faculty Developments at Prentice Hall. She has written Majoring in the Rest of Your Life: Career Secrets for College Students and Majoring in High School. She has also co-authored Graduating Into the Nineties, The Career Tool Kit, Keys to Career Success, Keys to Effective Learning, and the first edition of Keys to Success. In 1992 Carol and other business people co-founded a nonprofit organization called LifeSkills, Inc., to help high school students explore their goals, their career options, and the real world through part-time employment and internships. LifeSkills is now part of the Tucson Unified School District and is featured in seventeen high schools in Tucson, Arizona. JOYCE BISHOP holds a Ph.D. in psychology and has taught for more than twenty years, receiving a number of honors, including Teacher of the Year. For the past four years she has been voted "favorite teacher" by the student body and Honor Society at Golden West College, Huntington Beach, CA, where she has taught since 1986 and is a tenured professor. She is currently working with a federal grant to establish learning communities and workplace learning in her district, and has developed workshops and trained faculty in cooperative learning, active learning, multiple intelligences, workplace relevancy, learning styles, authentic assessment, team building, and the development of learning communities. She also co-authored Keys to Effective Learning. SARAH LYMAN KRAVITS comes from a family of educators and has long cultivated an interest in educational development. She co-authored The Career Tool Kit, Keys to Effective Learning, and Keys to Success and has served as Program Director for LifeSkills, Inc., a nonprofit organization that aims to further the career and personal development of high school students. In that capacity she helped to formulate both curricular and organizational elements of the program, working closely with instructors as well as members of the business community. Sarah holds a B.A. in English and drama from the University of Virginia, where she was a Jefferson Scholar, and an M. F. A. from Catholic University.